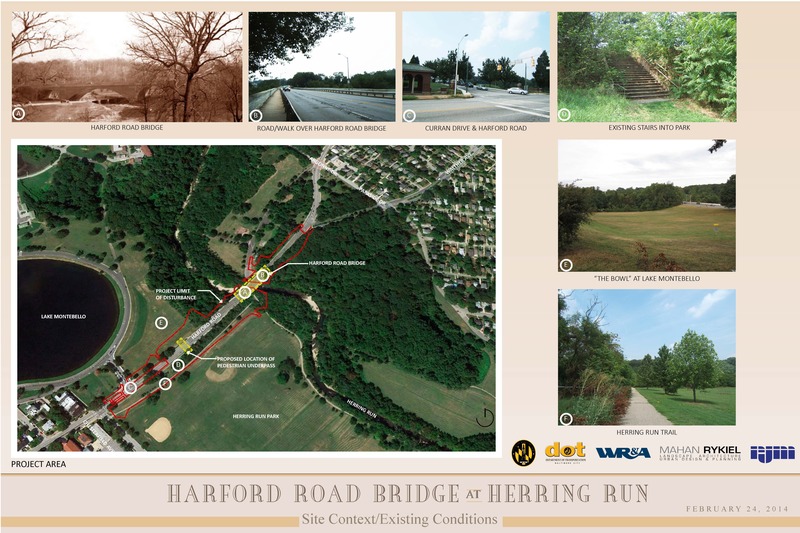 The Department of Transportation is pleased to announce the date for closure of the Harford Road Bridge over Herring Run, to allow for its replacement. The closure will occur on Monday, November 19, 2018 depending on weather conditions. The existing bridge is a filled arch, a design that makes it impractical to leave half of the bridge open while working on the other half and accordingly, the bridge must be closed completely to facilitate the work. The closure is expected to last for three years. During the closure, everyone who crosses the bridge currently will have to utilize alternate routes. 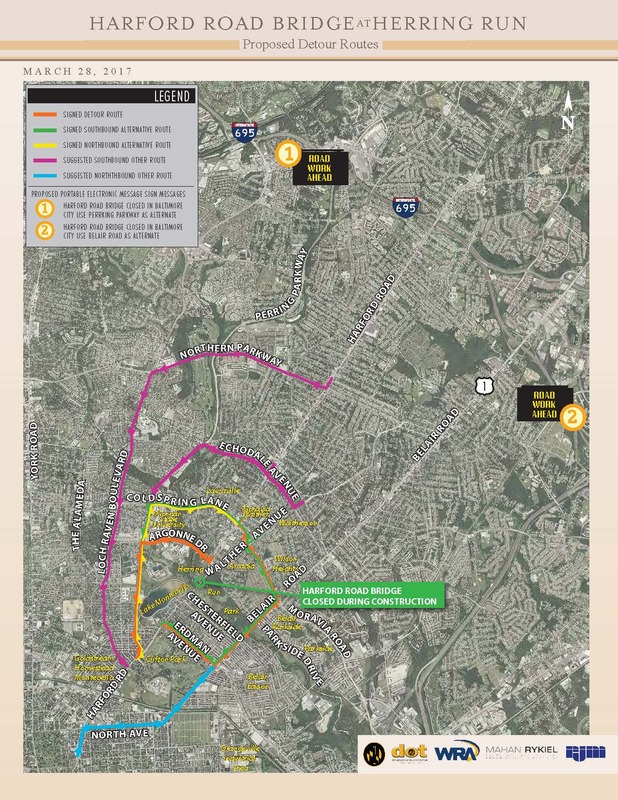 The two closest detour options for motorists are Belair Road to the East, and Hillen Road/Perring Parkway to the West. Motorists are reminded that trying to make their way through neighborhood streets in search of an alternate detour route will only delay their trip because no other streets in the area provide a crossing of Herring Run other than the two aforementioned detour routes. Pedestrians and bicyclist have other options. 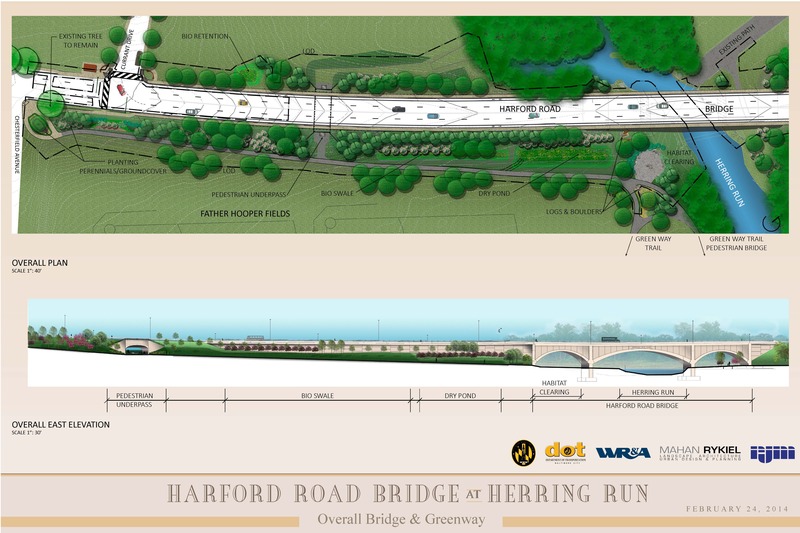 The Harford Road Bridge over Herring Run serves as a main artery for traffic in northeast Baltimore carrying an approximately 22,000 vehicles daily. The replacement structure will be a structurally efficient three-span, prestressed concrete girder bridge that maintains the aesthetics of the original 1911 structure with arch facades. Construction is expected to take 36 months to complete and will include a complete closure of Harford Road between Chesterfield Avenue and Walther Avenue. The new bridge includes dedicated bike lanes and ADA compliant sidewalks separated by flex posts in both directions. The project also includes the reconstruction of the Herring Run/Greenway Trail adjacent to the bridge, multiple stormwater maintenance facilities and the construction of a pedestrian underpass for a future trail extension. The last component of the project is the construction of a pedestrian bridge across Herring Run to replace an outdated structure currently under the vehicular bridge. Department of Transportation-Safety Division will deploy two (2) Transportation Enforcement Officers (TEOs) per intersection for the Harford Road bridge project. From the start of the project, TEOs will be deployed for two (2) weeks at the identified intersections .